Dr. Dodds is a native of Steuben county and grew up in Cohocton, NY. 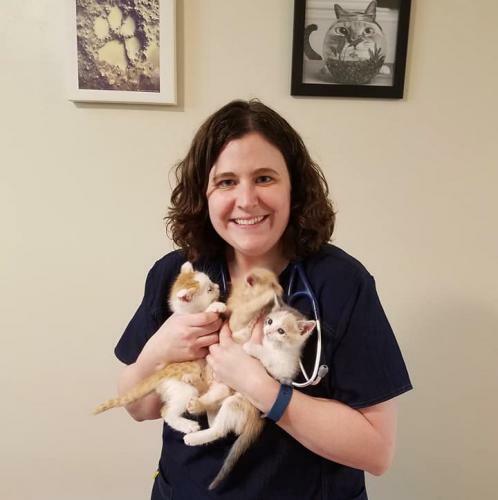 She attended Alfred State College for her associates in Veterinary Technology followed by the State University of New York at Geneseo for her Bachelor’s of Science in Biology. She then went on to attend the Atlantic Veterinary College at the University of Prince Edward Island, PEI Canada where she earned her Doctors of Veterinary Medicine. Dr. Dodds has a vast array of knowledge of all species including companion animals, exotics including pot bellied pigs, and farm animals. She will be offering new services in acupuncture as well as chiropractic; two great alternative medicine modalities that can be incorporated into our current cold therapy laser treatments. Dr. Dodds is also proficient at soft tissue general surgery, internal medicine and geriatric care. Dr. Dodds will also be offering ultrasound imaging services to our practice in the coming months. 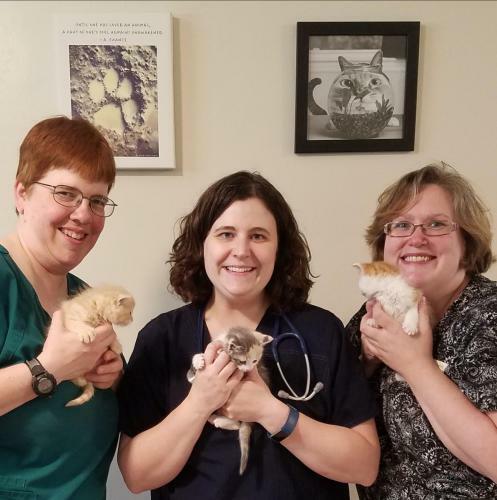 Dr. Dodds shares her life with her 12 year old beagle named Snape, her 2 year old cat named Simon, a small flock of Cochin chickens, and a large number of honey bees. She enjoys an array of outdoor activities including gardening, Kayaking, and snow shoeing. We also have a team of relief veterinarians who are available to conduct appointments while Dr. Dodds is away from the office. Terri is one of our Licensed Veterinary Technicians and our Office Manager. Terri earned her Associates Degree in Veterinary Technology from SUNY Canton and joined the Rio Vista family in March of 2017. Terri is also a licensed wildlife rehabilitator and has released numerous squirrels, opossums, chipmunks, and cottontail rabbits. Terri shares her home with her two dogs, a rabbit, a parrot, and cats. In her spare time, she enjoys horseback riding, reading, and playing board games. Jini is part of our animal care team. She has a degree from Alfred State College in Veterinary Technology and will be taking her exam to be a licensed Vet Tech in the near future. Jini enjoys that no two days in a veterinary hospital are the same and she is always learning something new. Jini shares her life with her four Nigerian Dwarf goats, her lab mix, and her rabbit. In her spare time she enjoys hiking, traveling, and reading. Cheri is one of our Licensed Veterinary Technicians. She earned her Associates Degree in Veterinary Technology From Alfred State College and joined the Rio Vista Family in August of 2016. Cheri shares her life with a dog, three cats, and a newborn baby (who we also welcomed to our family in May. Richelle is one of our Veterinary Assistants and our Inventory Manager. Richelle joined the practice in 1992 and has been growing and learning in the veterinary industry ever since. Richelle loves meeting new clients and getting to know all the different animals we see. Richelle has a Bachelors of Science Degree in Biology and is also Fear Free certified. She has two cats and in her spare time enjoys reading, baking, and playing the piano. Brittany is one of our client service representatives and joined the practice in 2015. 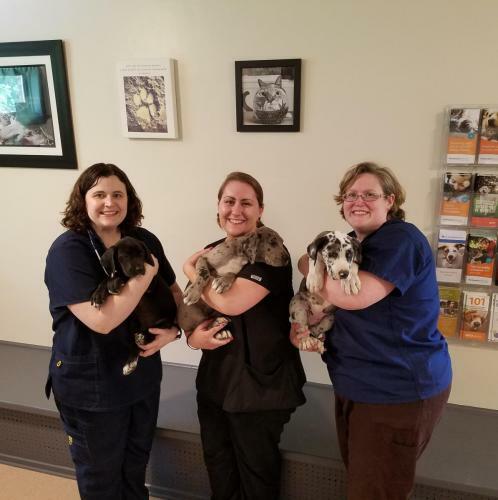 She also spends her time at the practice doing grooming, animal care, and assisting doctors and technicians with appointments. Brittany shares her life with one cat, and in her free time enjoys painting, fishing, and reading. Shaylon joined our Rio Vista Family in May of 2018. She is one of our smiling faces at our front desk and is also a certified pet groomer. Shay loves meeting all of the animals that come through our doors. Shay may also be found acting as a care taker for our animals and assisting with handling patients. Shay has multiple pets at home including two dogs; Kane and Karl, and two cats; Maddie and Milo. In her spare time Shay enjoys concerts and hanging out with her pets. Debbie is one of our client service representatives and our business office manager. Debbie joined the practice in August of 2016 and has an Associate’s degree from Alfred State College in Health Information Management. Debbie loves being able to give animals and their owners the care and comfort they need. Debbie has a strong background in livestock management and grew up on a dairy farm right here in Steuben County. Debbie has multiple pets including a goat, chickens, two dogs, and multiple cats. She enjoys reading, gardening, and spending time enjoying the great outdoors. Kyle is part of our animal care team and joined the practice in 2015. Kyle also spends his time at our practice assisting doctors and technicians with appointments. He is currently pursuing further education in the veterinary field. Kyle shares his life with four dogs and two cats.